A double-header this morning. I have no idea where the naked mole rat came from. The Palestra at Penn was undoubtedly prompted by the music of Palestrina, which was playing on WQXR when I woke — though it turns out that palaestras and Palestrina have nothing to do with one another etymologically, nor has either of them anything to do with palisades. 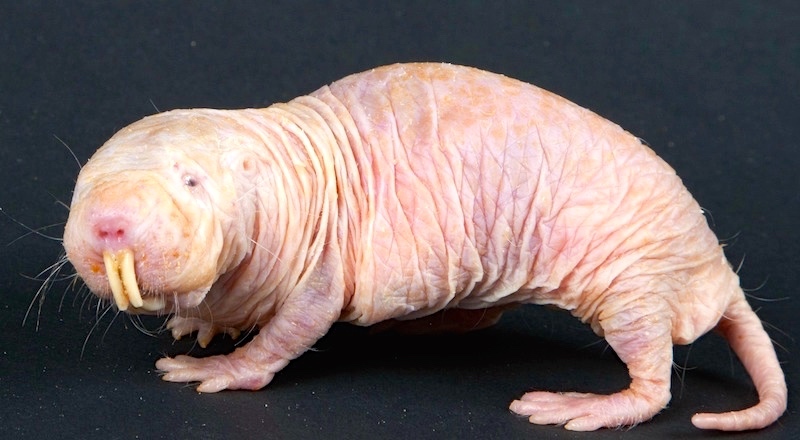 The naked mole-rat (Heterocephalus glaber) also known as the sand puppy or desert mole rat, is a burrowing mammal native to parts of East Africa and is the only species currently classified in the genus Heterocephalus. The naked mole-rat and the Damaraland mole-rat are the only known eusocial mammals. It has a highly unusual set of physical traits that enable it to thrive in an otherwise harsh underground environment; it is the only mammalian thermoconformer. (A thermoconforming organism adopts the surrounding temperature as its own body temperature, thus avoiding the need for internal thermoregulation). The mole rat also has a lack of pain sensation in its skin, and has very low metabolic and respiratory rates. It is also remarkable for its resistance to cancer and its longevity. Eusociality (Greek eu: “good/real” + “social”), the highest level of organization of animal sociality, is defined by the following characteristics: cooperative brood care (including brood care of offspring from other individuals), overlapping generations within a colony of adults, and a division of labour into reproductive and non-reproductive groups. … Eusociality is mostly observed and studied in Hymenoptera (ants, bees, and wasps) and Isoptera (termites). 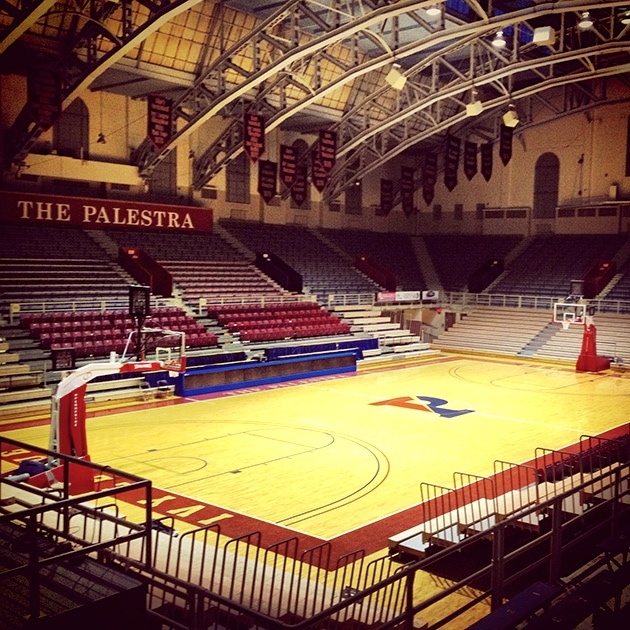 The Palestra, often called the Cathedral of College Basketball, is a historic arena and the home gym of the University of Pennsylvania Quakers men’s and women’s basketball teams, volleyball teams, wrestling team, and Philadelphia Big 5 basketball. Located at 235 South 33rd St. in Philadelphia, Pennsylvania on the campus of the University of Pennsylvania, near Franklin Field in the University City section of Philadelphia, it opened on January 1, 1927. … The building was completed in 1927 and named by Greek professor William N. Bates after the ancient Greek term palæstra, a rectangular enclosure attached to a gymnasium where athletes would compete in various sports in front of an audience. Penn’s Palestra was built adjacent to and today is connected to Hutchinson Gymnasium. Palestrina (ancient Praeneste; Ancient Greek: Πραίνεστος, Prainestos [adjective Praenestine]) is an ancient city and comune (municipality) with a population of about 18,000, in Lazio, about 35 kilometres (22 miles) east of Rome. … The origin of Praeneste was attributed by the ancients to Ulysses, or to other fabulous characters variously called Caeculus, Telegonus, Erulus or Praenestus. The name derives probably from the word Praenesteus, referring to its overlooking location. In any case, nothing to do with wrestling. Once we’ve seen that palestra was originally palaestra, it seems unlikely that the word has any etymological connection to palisade, though it’s entertaining to speculate that early palestras were surrounded by walls of wooden stakes (Latin palus ‘stake’). On the descendants of Latin palus — palisade, the Palisades, beyond the pale, Palo Alto, etc. — see my “Palisade” posting of 10/11/13 (with photos). This entry was posted on July 25, 2015 at 3:09 am and is filed under Compounds, Etymology, Language and animals, Music, Names. You can follow any responses to this entry through the RSS 2.0 feed. You can leave a response, or trackback from your own site.